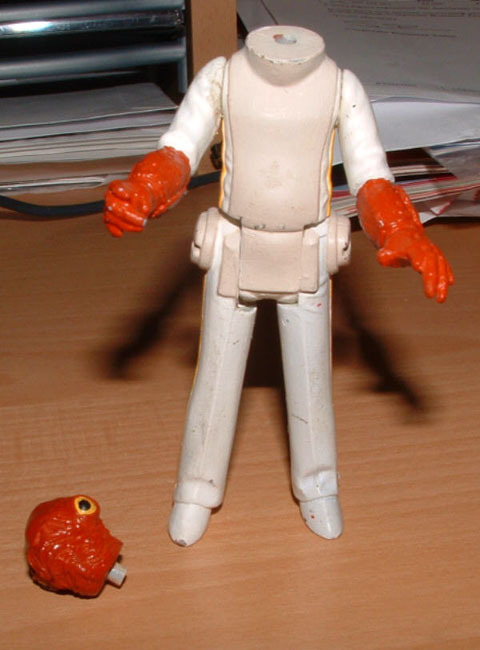 This Return of the Jedi Admiral Ackbar prototype is called a painted hardcopy. The hardcopy stage of the production process is a highly coveted one, making hardcopies more expensive to obtain than the more common first shot stage. 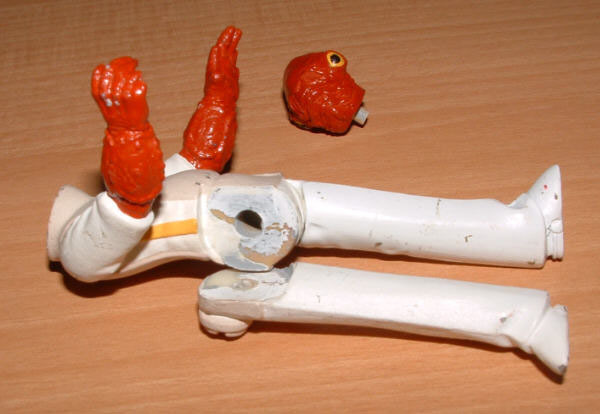 Hardcopies typically exhibit removable arms, legs, and heads. 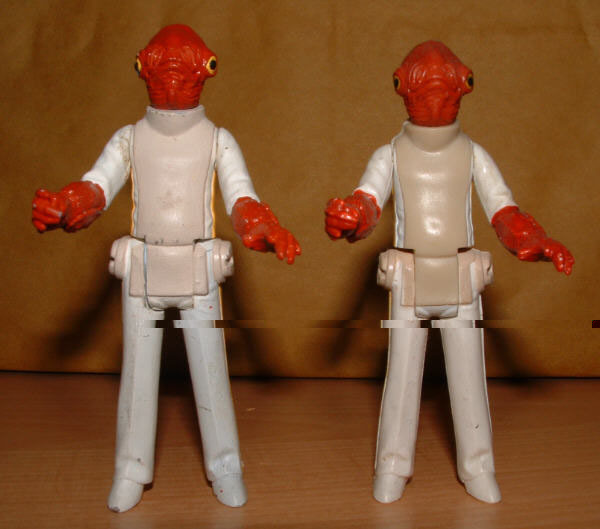 The photo above illustrates Ackbar with his noggin removed. The plastic attachment dowel is visible at the base of the head. Cylindrical metal dowels represent the most common method of attachment for hardcopy limbs and heads, however plastic dowels like the one seen here aren't totally out of the ordinary. 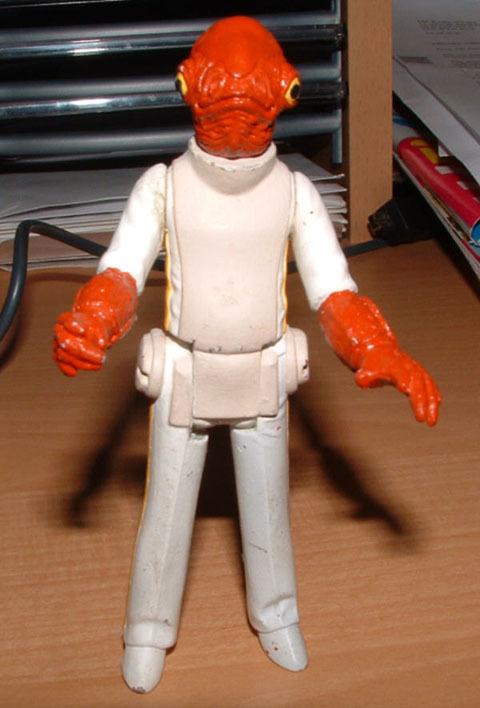 The limbs on this hardcopy were glued to the torso indicating it was probably used as a display model or photography sample. The glue has dried up on one leg affording to be removed from the torso. This characteristic provides a nice glimpse of the attachment point via the torso. The final photo shows the painted hardcopy (left) next to its production counterpart. Notice the vertical size difference between the hardcopy and production figure. The injection molded plastic used on production figures is subject to more significant shrinkage, thus a discernible size difference is readily apparent when a production figure is compared to a hardcopy.